What’s your favorite part of autumn? Football games and Pumpkin Spice Lattes are back and #fallcolors2018 is underway. And for leaf peepers with inquiring minds who want to know about the measurable benefits of the amazing trees all around us, the USDA Forest Service has a useful app for you: I-Tree. Now available for download, I-Tree 2018 is peer-reviewed software that helps quantify that our trees are so much more than shade and autumn colors. Trees remove atmospheric carbon dioxide and pollution, reduce storm water, modify temperatures, and more. For example, the MyTree app assesses the value of one or several trees using the trunk measurement and location data. Our hickory tree apparently sequesters almost 65 lbs. of carbon dioxide annually, a pine, 101 lbs., and an oak, 1338 lbs. Although calculations show the eastern redbud at zero carbon dioxide sequestered annually, it’s still my favorite, and pollinators love it! Landscape – select a location and then explore the tree canopy, basic demographic information, and estimate amounts and dollar values of the carbon, air pollution, and hydrologic benefits provided by the trees. You can also prioritize areas where tree planting will be most beneficial. Planting Calculator – helps estimate the long-term environmental benefits from a tree planting project, from apple trees to willows. Enter information about the tree, such as species, size, and distance to the nearest building, and the program calculates greenhouse gas sequestered and avoided, energy conserved, air pollutants captured and avoided, and storm water filtered. 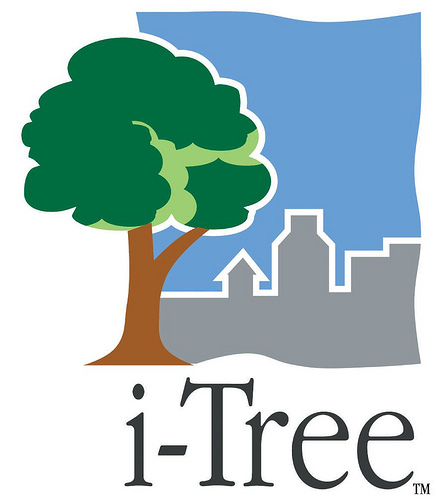 I-Tree is an initiative between the USDA Forest Service, National Arbor Day Foundation, Davey Tree Expert Company, and the Society of Municipal Arborists. Finally, here’s a good resource if you’re planning a scenic drive and want to know peak viewing times for tree color changes in your area. While admittedly not 100 percent accurate, SmokyMountains.com has updated its annual fall foliage prediction map based on data from the National Oceanic and Atmospheric Administration. And, if you’re thinking about planting a tree, fall is the best time!